Access to funding is one of the toughest challenges, especially for SMEs. Using asset finance, you can unlock some of the value of your business by using existing assets or unpaid invoices to generate the funding you need, when you need it. So what does keep business owners awake at night? It’s no secret that funding can be a continual challenge, especially for SMEs. And while our question may be slightly tongue-in-cheek, many business owners and managers really do worry about obtaining the financing they need to keep their businesses running at full speed. Of course, there are many different types of funding available to SMEs, from traditional bank loans, bridging loans, equity and debt capital, to venture capital and private equity money. These last two are usually only relevant for larger or very fast-growing companies with multi-million-pound funding requirements. The past few years have also seen an explosion in growth of crowdfunding and peer-to-peer (or P2P) loans, but these are topics for another day. The truth is, there are many funding options available to SMEs, and it’s often difficult to know where to start. In this article, we’ll focus on just two of the financing options available to businesses of all sizes: Asset Finance and invoice finance. Both of them involve unlocking value that already exists in your business. Though perhaps less well known than some of the more traditional financing methods, they can both be used to help deliver the funding that a business needs. I’ll explain more a bit later. First, let’s take a step back. SME Funding – How Hard Can It Be? SMEs are often referred to as the lifeblood of the economy. 96% of the UK’s 5.7 million private business have fewer than 10 employees, while across the UK, SMEs account for 60% of all employment and more than half of all revenues (source: Department of Business, Innovation and Skills). But despite their vital role in the economy, SMEs struggle more than any other type of borrower to obtain overdrafts, bridging loans or other forms of funding. At first glance, it’s easy to see why: SMEs, particularly start-ups and early-stage businesses, are inherently risky for any lender or investor. We’re all aware of the depressing statistics that 20% of all businesses fail within the first year, and that half are gone within 5 years. Those aren’t great odds for a would-be lender or investor. It’s also difficult for a young business to demonstrate an impressive track record of profitability. Building a business into a profitable enterprise takes time, and banks and other lenders will factor this into their credit assessment process when evaluating applications for business loans, bridging loans or some other type of credit facility. Often overlooked as a means of raising funds, asset finance (often referred to as asset-backed financing) means any loan that’s secured against assets your business already owns. Depending on your business, these assets may include property, plant and machinery, stock/inventory, as well as financial assets, investments, and so on. The assets can be pledged as collateral to the lender, and in theory, can be sold to cover the unpaid principal amount of the loan in the event of a default. It works just like a traditional mortgage loan, where the mortgage lender retains a charge against your house and can sell the house to recover their loan, in the event you stop making your monthly payments. Some asset-backed loans can also be taken out against intangible assets such as intellectual property or future income streams too, although this is rarer. Those of you of a certain age may remember David Bowie’s ‘Bowie Bond’ in 1997, through which the legendary singer raised US$55 million in the form of a bond, secured against future revenue streams from the royalties on his back catalogue of recordings. Bowie was truly a financial innovator, not just a musical one. The funding will often be significantly cheaper than, for example, taking an unsecured loan or giving away a large chunk of equity in your company to a new shareholder. Asset finance is a rapidly evolving industry in the UK, and it isn’t confined to bricks and mortar: financial assets like shares or investment portfolios, cars, jewellery, even wine and art collections are being used as collateral for business loans today. If an asset is worth something, then, in theory, it can be used as collateral. Pros: Lower risk to lender means a higher chance of qualifying, plus more attractive financing terms. Mostly structured as loans, so no need to give up any ownership or control in your business. Cons: Make sure you’re confident that you can repay the loan, otherwise your collateral may be at risk. May not be suitable for smaller businesses who do not have assets that can be used as collateral. Invoice Finance is mainly used as a working capital or cash-flow facility. However, it can also be used to raise cash where a business does not own property or other assets that can be pledged as collateral for an asset-backed loan. 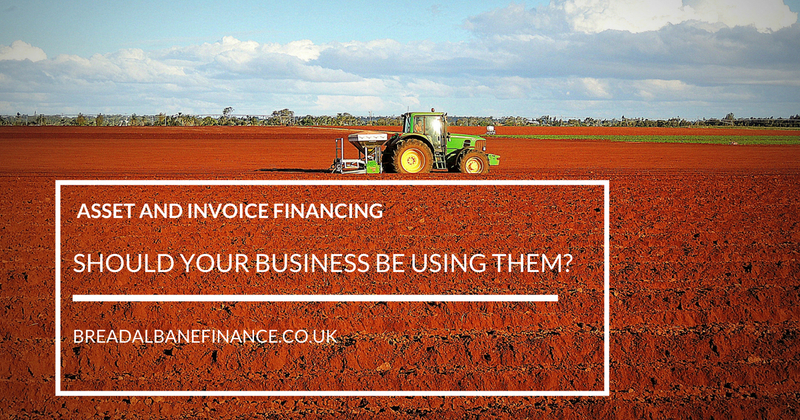 Invoice finance allows a business to borrow money against the value of unpaid invoices. Put simply, a lender will take assignment of your unpaid invoices and typically allow you to borrow up to 90% of their value. The Lender is repaid when the invoices have been settled. They will then pay you the balance back that you did not receive up-front, less a fee for the use of the facility. In some cases, the lender allows you to collect the invoices from your customers as usual, and the agreement remains confidential from your clients; this is called Invoice Discounting. Alternatively, you can outsource the payment collection from your clients to the finance provider, with full disclosure of the arrangement to all parties; this is commonly known as Invoice Factoring. We won’t get into a detailed discussion here of the differences between Discounting and Factoring, or which one makes the most sense for you and your business. However, as a general rule of thumb, a business is more likely to qualify for Discounting if it is well established, profitable and with good systems and processes in place. Bottom line, if your business cash-flow suffers from having long credit terms with your clients, and if your invoices can take a long time to be paid, invoice discounting or factoring may well be worth considering. Cons: Not all businesses will be happy to relinquish control of their debtor book or for their clients to be aware of their financing arrangements, which is required in the case of invoice factoring. Confidential Invoice Discounting can overcome these objections. The truth is, there isn’t a “one size fits all” solution to raise funding for your business, especially with asset finance. Every business is unique, and so it’s impossible to know which one is most suitable or attractive for your business. Both asset finance and invoice finance are very important funding options that should not be overlooked. There are many specialist financing firms that provide both products, so if this is something you think may be relevant for your business, please get in touch with us for a no-obligation chat with one of our experts. And remember, if you do have a property or other collateral that you can use to secure a loan, then that probably puts you in the best position of all to secure financing. Collateral means lower risk for the lender, and that means a lower cost of funds to you. And when all is said and done, that’s probably one of the most important features you’ll be looking at when considering your funding options. Breadalbane Finance are commercial finance experts. Our aim is to find the most appropriate business funding solutions for you. If you’d like to learn more about asset finance or discuss any other aspect of this blog in more detail please do not hesitate to contact us today.